About 800 travelers were stranded Sunday morning when Cleveland-Hopkins International Airport lost power. (CNN) -- The lights were back on at Cleveland, Ohio's largest airport Sunday afternoon after a transformer explosion cut power at terminals for more than seven hours, an airport spokeswoman told CNN. About 800 travelers were stranded Sunday morning when Cleveland-Hopkins International Airport lost power at 6:50 a.m. ET, spokeswoman Jacqueline Mayo said. Terminals went dark and air traffic ground to a halt, but the control tower, runways and taxiways remained lit by backup generators, Mayo said. The lack of power at terminals made it impossible to check in or screen passengers. Travelers remained calm and waited for some time, Mayo said. But then many gave up and left, not knowing when operations would resume. "I think they were anticipating the lights would pop on any minute, but a couple of hours in they were resigned to the fact that they weren't going to come on for a while," Mayo said. All power was restored by 2:30 p.m., and crews were checking that no cold-sensitive equipment was damaged and that all systems were running smoothly, Mayo said. The transformer exploded after road salt swept into the air gradually corroded power lines, Mayo said. 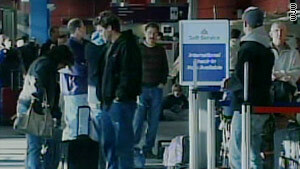 While the problem was resolved, travelers were still experiencing delays. Continental suspended its operations until at least 6 p.m., while Delta Air Lines announced that all of its flights would be on hold until at least 3 p.m.
More than 300 flights a day take off from or land at the airport.